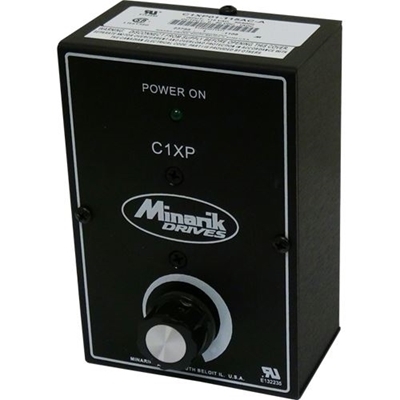 For applications requiring basic drive protection from falling objects or incidental contact, Minarik Drives offers the C1XP03-115AC-A, a low cost, high performance pulse-width-modulation (PWM) DC motor speed drives housed within a NEMA 1 enclosure. This filtered drive has a power-on LED and a power switch/speed adjust knob located on the front of the case. With a 115VAC input, the XPs control 130VDC brush-type motors from 1/10 to 1/4 HP.